At this point, South Park has reached a point that we might call “predictably shocking.” We know they’re going to take an issue of the day, and present in some skewed subversive fashion, to the point that when they do so, it really shouldn’t be surprising anymore. Yet somehow, figuring out exactly how they’re going to pull it off is not only still enjoyable, but it can still produce plenty of “wait, what? !” moments over the course of a season, or in this case, in the course of a single episode. This isn’t entirely shocking; long before we were inundated with news of children being shot on a depressingly regular basis, the boys have always been jaded, and with good reason, as they’ve pretty much seen everything. But the real revelation comes when the entire town is just as numb to the constant shootings as the kids are, and Sharon is seen as unreasonable for yelling at everyone so much about it. 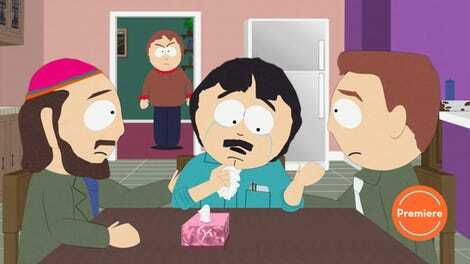 Here, we see the best and worst of Randy Marsh. On the one hand, he’s undeniably hilarious as he not only blames the entire thing on PMS/Menopause, but mimes to Leopold Stotch that Sharon’s anger is a result of why Leopold guesses to be “crazy red time,” but it’s also probably the worst we’ve ever seen him behave as a husband. Even in “Broadway Bro Down,” he clearly felt guilty about his actions. But no one calls Randy out on his behavior, because they all agree with him, and Sharon’s concerns are pushed aside by an entire town who is simply tired of hearing about. What goes on here is interesting with in the context of how Trey and Matt and have treated liberal celebrity activism in the past, both on South Park and in Team America. Their general contention has been that the liberal scold doesn’t really care and is simply being opportunistic. Portrayals of Sally Struthers, Rosie O’Donnell, and Rob Reiner all come to mind. Here, though, the tone being set would seem to want us to think that Sharon really is the only sane one, and that the rest of the town has truly gone mad with apathy. This could be credibly read as an examination of how South Park’s “you’re an idiot for caring” attitude has influenced some of the worst aspects of modern culture. South Park has been reckoning with its own legacy since Season 19, and this makes it clear that the trend of self-examination isn’t going to stop. The subplot focuses on Cartman realizing he failed his math test because Token won’t let him cheat anymore, which Cartman assumes is because he didn’t like Black Panther. In principle, I should find this tiresome; haven’t we seen this in “World War Zimmerman,” and really, in the entire plot of season 20? Still, I couldn’t help but smirk at the revelation because of course that’s what Cartman thinks the problem is! For what it’s worth, this actually is a nice subtle critique of the current cultural trend where one’s perceived morality has become increasingly tired to whether or not they like and dislike the right pieces of pop culture, but also it’s just kinda funny that Cartman immediately assumes that it must be about Black Panther and not because Token is legitimately bothered by Cartman cheating off him. As a South Park season premiere, “Dead Kids” largely accomplishes its main goals. It gives us the usual bit of shock and disturbance as we prepare to accept this show back into our lives again, but also, it sets up multiple potential storylines for what should be an amusing story-thread. I won’t lie; part of me did go in hoping they’d go back to standalone episodes, like they initially promised last year, but this episode got me excited for another unwinding thread that will hopefully be more like season 19 than season 20. What holds this episodes back is that certain scenes — like Randy wooing Sharon after using a fake shooting to come to the school — just seem a bit to outrageous and nonsensical even by the shows own standards. That being said, it’s gone much farther over the line in previous episodes, and for the most part, “Dead Kids” shows that South Park can still stand right on the edge of basic human decency, and produce something that you can’t help but laugh at. Hey everybody, John Hugar here. Taking over the South Park beat from Dan Caffrey. Let’s give S’More Schnapps toast to Dan, and the fine work he did covering this show over the last four seasons. So...does this mean everything that happened last season is just forgotten? Cartman and Heidi? PC Principal and Strong Woman? Huh. It’s interesting that Trey and Matt have apparently decided that arcs can be season long, but they can’t be stretched out over the course of two seasons. Token definitely is hiding something about Black Panther, right? Like, my strong sense was that Cartman’s idiocy let to him being accidentally right. The obligatory Fortnite reference is a bit forced, but nowhere near as forced as it would if this was The Simpsons.